Game Day Preview: This is the second to last home game before the Christmas break. The Rockets host Victoria Friday before heading out on the road for four consecutive games to wrap up the opening half of the season. The Rockets host the Tri-City Americans tonight in the fourth and final meeting of the season between these two playoff rivals. The Rockets are 2-1-0-0, with all three games decided by a single goal. The road team has won all three games; including the Rockets 3-2 overtime win last Friday at Toyota Center. The Americans beat the Rockets at Prospera Place (5-4) back on October 13th. Leif Mattson, Kaedan Korczak and Kyle Topping lead the Rockets offensively in the three games with four points apiece. Mattson and rookie Dallon Wilton lead the team in goals with two each against the Am’s. 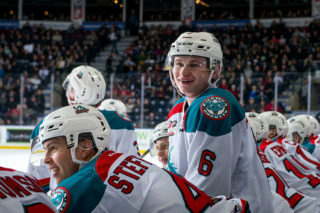 The Rockets are 8-5-2-0 in 15 games under head coach Adam Foote. Who’s Hot: Nolan Foote has points in 6 of his last 7 games. Foote has 5+4=9 over that stretch. Leif Mattson has four goals in his last 5 games. The 19-year-old has registered at least one shot on goal in 28 of the teams 29 games this season. Kyle Topping has 3 goals in his last 5 games. Topping has registered a point in 21 of the teams 29 games this season. In his last three appearances, goaltender James Porter has stopped 85 of the last 91 shots (.934 save percentage) he has faced. The Rockets penalty killing unit is 15 for 15 in their last three road games. 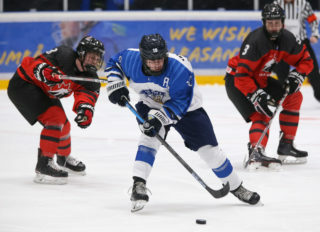 Broadcasters Notebook: Lassi Thomson has been invited to Team Finland’s training camp for the upcoming World Junior Hockey Championships….Libor Zabransky has been invited to Team Czech Republic’s training camp as well……The Rockets traded 19-year-old Jack Cowell to the Kootenay Ice November 29th for a third-round bantam pick… The Rockets are 5-8-1-0 against BC Division teams this season…Nolan Foote has scored 8 home goals and 8 road goals this season …7 of Kyle Topping’s 12 goals have come on the road…16 of Topping’s team-leading 31 points have come on the road….The Rockets have only one December birthday to celebrate. 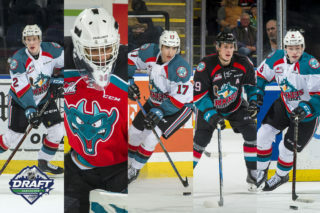 Lane Zablocki officially turns 20 on December 27th….Four members of the Kelowna Rockets have been named to NHL Central Scouting’s November “Players to Watch’ List. 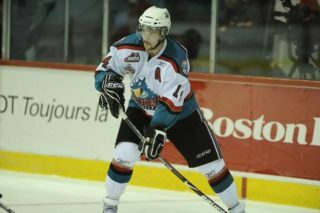 Forward Nolan Foote is an ‘A’ prospect, meaning a first-round candidate. Kaedan Korczak is a ‘B’ prospect which means he is a second or third round candidate. 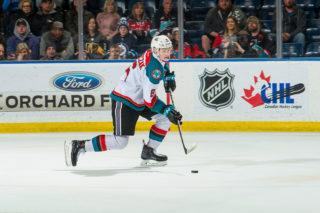 Roman Basran/Lassi Thomson are ‘C’ prospects, which means he could be taken in the third to the seventh round…Adam Foote was officially named the new head coach of the Kelowna Rockets on October 23, 2018, replacing Jason Smith.,,.The Rockets are 3-7-1-0 when playing the second game of back-to-backs….The opposition has opened the scoring in three straight games…The Rockets have scored 38 goals on home ice or 2.92 goals per game…Last season after 13 home games the team had scored 57 goals or 4.4 goals per game. Most shots on net: 45 @ Seattle October 6th, 2018 (4-1 L). Most power play goals allowed: 4 vs. Seattle October 10th, 2018 (9-6 L). T-Birds were 4/5 on the power play.